Events in the Turkic countries were held on the Holodomor, a man-made famine in Soviet Ukraine in 1932 and 1933 that killed millions of Ukrainians. The initiator of the events was the World Congress of Ukrainians. In particular, the commemoration of Holodomor victims was held in Azerbaijan, Kazakhstan and Uzbekistan. In Azerbaijan, the relevant events took place on September 9. They were attended by Ambassador of Ukraine to Azerbaijan Oleksandr Mishchenko, members of the diplomatic corps, members of the Ivan Franko organization, members of the World Congress of Ukrainians. Ambassador of Ukraine said that as a result of the Holodomor millions of Ukrainians died. As part of the event, the children read thematic poems, read the memoirs of the Holodomor witnesses. On September 10, memory of Holodomor victims was honored in the capital of Kazakhstan - Astana. The event was attended by representatives of the Ukrainian diaspora. In St. Joseph's Church, candles were lit, and at the Ukrainian Embassy in Astana they a documentary was screened about the events of 1932-1933. According to Ambassador of Ukraine to Kazakhstan Ivan Kuleba, in more than 20 countries of the world the Holodomor was recognized as genocide against the Ukrainian people. In turn, the Head of the Institute of History of the Republic of Kazakhstan Amangeldy Kashkimbaev drew parallels between the Great Famine in Kazakhstan and the Holodomor in Ukraine. He urged not to forget about these tragedies. Memorable events were also held in Pavlohrad and Karaganda. On September 11, representatives of the Ukrainian and Crimean Tatar diasporas, as well as stuff of the Ukrainian embassy officers, paid tribute to the memory of the victims of the Holodomor and lit 85 candles, symbolizing the next anniversary of the genocide. Ambassador of Ukraine to Uzbekistan Yuri Savchenko honored the memory of the Holodomor victims, as well as those who died during the events of September 11, 2001 in New York. 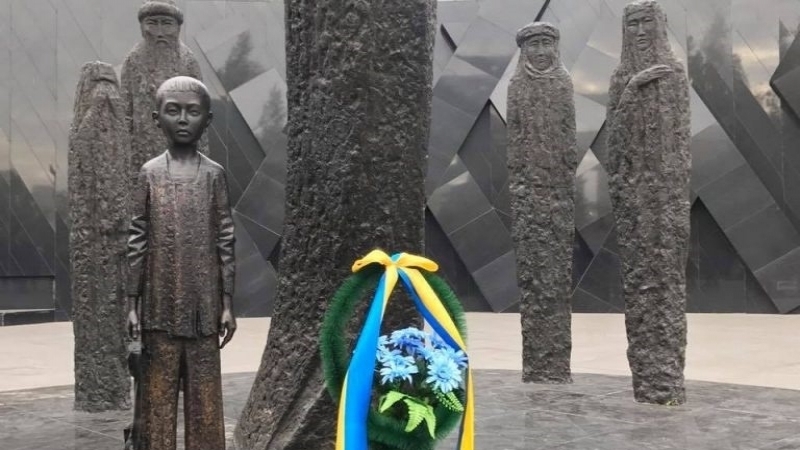 Earlier, on September 2, on the initiative of the World Congress of Ukrainians, the Holodomor victims of 1932-1933 were commemorated in Ankara. On this occasion a memorial service was held in one of the Catholic churches of the Turkish capital. The event was attended by representatives of the Embassy of Ukraine in the Republic of Turkey, headed by Ambassador Andrii Sybiha, as well as members of the Ukrainian and Crimean Tatar communities.